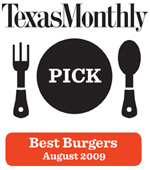 Black Buffalo Burger Voted #27 Burger in Texas! Texas Monthly Review: #27. If, like us, you have a deep and abiding love of both buffalo wings and hamburgers and have often wondered if together they would not produce something greater than the sum of their parts, this is the burger for you. The tangy vinegar-and-Tabasco sauce is hot but not overpowering, and the richness of the blue cheese is complemented by the thick tomato slices and a delicate spring mix of arugula and spinach. We know that sounds a little sissified, but balance is provided by the sports bar’s pool table, dart boards, waitresses in short shorts, and abundant flat-screen TVs tuned to ESPN.